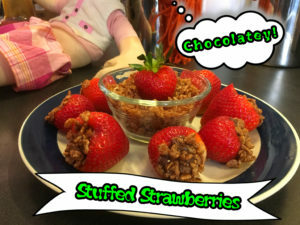 This is a great summer treat that could be used with raspberries for smaller bites! Cut off tops of each STRAWBERRIES being sure to core the center out. Put NUTELLA (or Chocolate Pudding/Mousse) in plastic baggie, forcing down to tip of baggie. Cut off small tip of baggie. Squirt NUTELLA into each STRAWBERRY until slightly overflowing. Garnish by dipping NUTELLA end into Cocoa Krispies (or Sprinkles or Chopped Nuts). Try freezing for a cool treat!